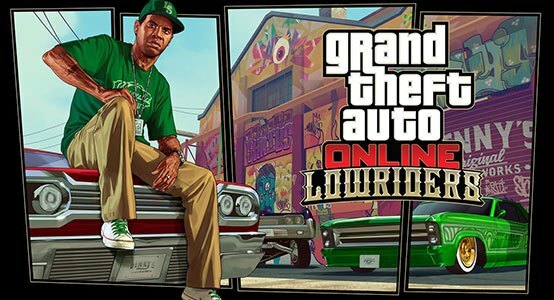 The Grand Theft Auto Online Lowriders DLC is definitely worth checking out! Rockstar dropped a major update for GTA Online today in the form of the Lowriders DLC. This free upgrade brings a plethora of new content including new player customization options, new car mods, a new weapon, a “personal vehicle remote” and of course, the ability to create some pretty epic lowriders similar to what you might remember from GTA: San Andreas. This update also brings a new chain of missions from Lamar, and if you want to mod your lowrider you’ll have to complete the first one. The whole mission chain is actually pretty fun, and fairly challenging due to the swarms of enemies you’ll encounter. The pay is similar to heist setups, and once you finish all 8 you can easily repeat them by calling Lamar. The biggest part of this update for me is the new car mods, and the ability to create your own classic LS lowrider. But, they don’t come without a massive price tag, to completely mod a lowrider to 100% you’re looking at around $1,000,000, or more!!! Just the “custom” upgrade to make the vehicle a lowrider costs roughly $350,000-$400,000. Want the good hydraulics? That’s another $250k! So, if you’re going to build your balled out Chino, make sure you have some scratch put away to do so. Also, keep in mind that the lowrider mods can only be purchased at Benny’s Original Motor Works (where you start & end the first of the new Lamar missions). What’s really awesome is that this new update has brought quite a few people together to show off their newly customized cars, but I’m sure that’s only going to last for a week or so until everyone has seen everything. But, for now, it’s pretty cool to see a bunch of people sitting outside of the mod shop checking each other’s creations out. The new “personal vehicle remote” is another extremely cool addition in this update, and it might seem novel, but it gives a lot of people something they really wanted. It allows you to control your vehicle’s motor, headlights and radio from outside of the car, as well as allowing you to pop the trunk, hood and any doors – to show off the $250,000 hydraulic system and the $80000 worth of speakers you just installed into your minivan. Yes, the speakers actually do make a difference, again, similar to the “bass boost” from GTA: San Andreas. You can access the personal vehicle remote & the ability to open/close doors, etc, through the Interaction Menu (“m” or hold “back” by default). The options are roughly in the middle of the list, so you’ll have to scroll down a ways to find them. It works for any vehicle you have, so you can show off any car you’ve customized – not just the lowriders. Something that I’ve always wanted to do in GTA Online has been to customize the interior of cars, and now we’re finally able to do that, but only on the lowriders (I think). I wouldn’t doubt that R* will start implementing interior customization across to the other more popular cars as well. I definitely wouldn’t mind a zebra striped interior for my Zentorno or T20. Pretty much everything major can be modified, from the gauges, the steering wheel, an inaccurate column shifter, and you can even throw a bobblehead on the dash. You can also customize what “trim” the interior has, and the color of that trim. Lime green gator skin, a chain steering wheel, beer tap shifter and the Grim Reaper? You bet’cha. Also added in with the Lowrider DLC is the ability to purchase a fourth property, just in case having storage for up to 30 cars wasn’t enough, now you can have up to 40! 200 weapon spawns were also added to the free roam map, and they range from pistols to miniguns and everything in-between. There was also a whole bunch of clothing and other player-customization items added, but I honestly haven’t had a chance to check them out yet – I spent all my time customizing lowriders! If you want to know more, you could always skim through the full list of changes. All-in-all, this update is one of the biggest and easily the best since the heists DLC was dropped, and hopefully it’s a sign of things to come – meaning bigger & better updates. I’m still waiting to be able to rob the random banks you find strewn across LS… You know the ones that look like you should be able to rob them – identical to the one you rob during the very first heist? Yeah, those. Since booting up GTA Online this morning, some kind of error has cropped up between the Rockstar Social Club and Steam. “Code:1000.50” is what comes up for me, and it’s seemingly coming out of nowhere, this error code also points to the Steam servers being “under maintenance”.. It’s been reported by a whole bunch of other people on the GTA:V Community Hub on Steam, so don’t panic because you’re not the only one currently blocked from GTA Online. I was finally able to get around the problem by simply booting up GTA:V (single player) and then loading GTA Online from there. Other people have said that verifying the game’s cache worked, but that didn’t work for me (or a lot of other people). Although neither of these are very reliable, but they might work, so it’s worth a shot. GTA: Online seems to be working fine for quite a few of the people who were having connectivity issues including myself. But, a lot of people are still locked out of GTA. With that said, I found this thread on the Steam Community that contains a super simple fix which seems to have worked for a whole bunch of people including myself – you might as well try it out.